Four members of the IMU suicide assault team that attacked the US PRT in Panjshir . Image from the IMU’s website, Furqon. The al Qaeda-linked Islamic Movement of Uzbekistan claimed it executed last weekend’s suicide assault on a Provincial Reconstruction Team base in the normally peaceful Afghan province of Panjshir. The Islamic Movement of Uzbekistan, or IMU, claimed credit for the Oct. 15 suicide attack that killed two Afghan civilians and wounded two security guards at the base. The attack consisted of a five-man team of heavily armed fighters. The attack began when one of the suicide bombers detonated a car packed with explosives at the front gate of the US-run Provincial Reconstruction Team base in the Rakha district. The attack in Panjshir is the first of its kind in the northern province since the US invaded Afghanistan in late 2001. The province is the birthplace of Ahmad Shah Massoud, the famed Northern Alliance commander who was assassinated in a suicide attack in Takhar province just two days prior to the Sept. 11, 2001 attacks. Under Massoud’s leadership, the Panjshir Valley held out against both the Soviets and the Taliban. The IMU recently published a statement on the Internet claiming the Panjshir attack, and released two photos of four of the suicide bombers. The IMU fighters are dressed in military camouflage uniforms and are sporting assault riffles, a machine gun, and a rocket-propelled grenade launcher. The IMU said the fighters were Afghans from the northern province of Kunduz. 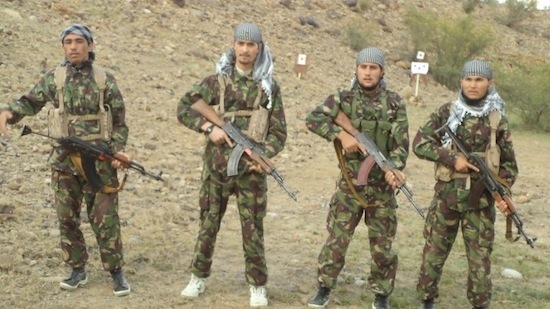 Islamic Movement of Uzbekistan fighters often serve as bodyguards for top Pakistani Taliban and al Qaeda leaders. The IMU fights alongside the Taliban in Pakistan and Afghanistan, and has stepped up attacks in Central Asian countries as well. Isn’t it time to start working with Central Asian and Russian intel agencies to identify and eliminate those insurgents before they go out of control? I am sure there will be mutual benefit for everyone, in our case, saving some American lives in Afghanistan. Was it Stalin that said “religion is the opium of the masses?” well they are sky high over there. This religion thing is going to be our end 1 day. There has been & continues to be a tremendous amount of cooperation between Russian intel & other SCO members with ISAF. It has been going on for quite some time.